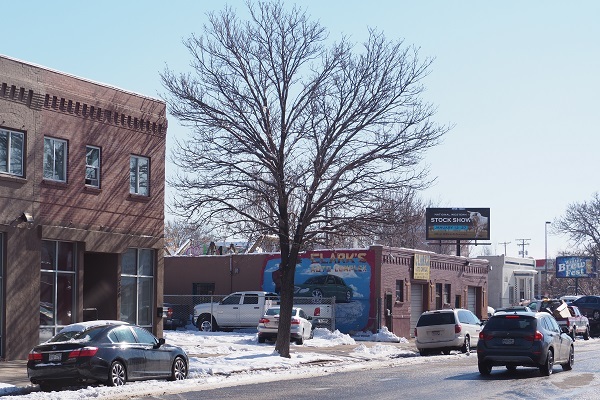 A developer is asking the city to rezone the 3600 block of Downing and Marion Streets, near the border of Cole and RiNo, as part of a plan to bring a grocery store and 200 residential units to the block. The plan also calls for the elimination of a stretch of road in the area, which sits at the intersection of Denver’s old and new road grids. 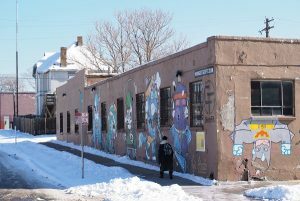 A Denver City Council committee voted unanimously Tuesday morning to send the rezoning request by developer Andrew Feinstein’s EXDO Management — owner of the nearby EXDO event center and Tracks LGBT nightclub — to the full council. It is slated to have a public hearing before council on March 11. The block consists of one home and five one-and-two story office and industrial buildings, one of which an auto body shop uses. Feinstein, and Denver-based development partners Elevation Development Group and Kentro Group, ultimately want to build an approximately 30,000-square-foot retail space intended for a grocery store on the 2.6-acre site, along with 200 residential units. Ten percent of the apartments would be restricted to those making less than 60 percent of the area median income; Feinstein said that only 2 percent is required. Speaking to the committee, Feinstein said he has been active in the neighborhood for over a decade, and pitched the project as one that meets multiple community needs. The block is currently home to a mix of one and two-story buildings. “The two things that come up the most are we need a grocery store and we need more affordable housing,” he said, describing discussions by nearby residents. Speaking to reporters after the meeting, Feinstein said he is in “deep, heavy negotiations” with a particular grocer, who is “kind of helping us design the site.” He declined to name the grocer, but described its offerings as full-service and affordable, with ample fresh produce, and said he likely would be able to disclose the company in the second quarter, provided the rezoning request is approved. “Without this zoning, we cannot make this grocery store work,” Feinstein said. Feinstein described the site as a food desert. The closest mid-to-large-size grocery store is currently a Natural Grocers at 3757 Brighton Blvd. That store is about 15,000 square feet, half the size of the proposed store. Feinstein is asking the city to rezone the block to C-MX-3 and C-MX-5, as well as C-MS-5. Practically speaking, that would mean the development team would be able to build up to five stories on the entire block, with the exception of an area within 35 feet on Marion Street, on the east side of the site. That portion would be restricted to three stories. The block is shaped by Lawrence Street, which curves upward to merge with Marion Street. An area plan the city adopted in 2009 called for that portion of Lawrence Street — which a city official Tuesday called the “Lawrence swoop” — to be eliminated. Last year, EXDO purchased the road and two triangle-shaped medians from the Colorado Department of Transportation, in an effort to achieve that goal. EXDO’s plans also call for Downing and Marion Streets to become two-way streets. ‘It’s going to become a much more safe pedestrian environment,” Feinstein said. Hirt said the city has received 132 public comments regarding the rezoning request, with 130 of them in support, including the comments made by neighborhood organizations Curtis Park Neighbors and the RiNo Arts District. Hirt said the remaining two comments represented the owners of four nearby properties, and opposed the rezoning of the two triangle-shaped islands sold by CDOT, which provide a small amount of green space to the neighborhood. Feinstein said he is targeting an early 2020 groundbreaking.